Last week I had the privilege of having a class with 20 or so ladies. I usually do this class one every year where we create Birthday Cards. They then give out the same cards throughout the year when their birthdays come around. 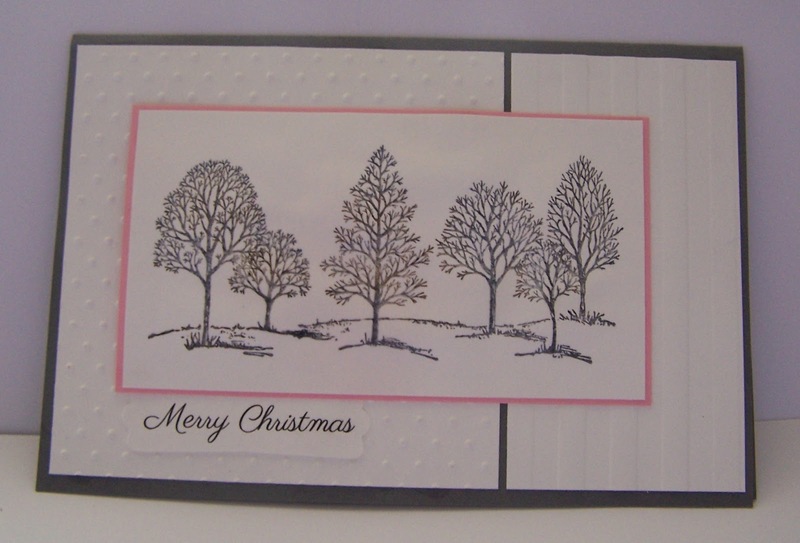 For something a little different, we decided to create Christmas Cards & concentrate on embossing, which was a huge hit! Doing a class this size can be quiet exhausting & utter chaos, but I think we have it down to a fine art now whereby we are in about 5/6 small groups. Each group has their own supplies, including inks, stamps, kits, etc while at the same time creating 5/6 different cards. In fact, this time round I had a table where I left the Punches to be used, Big Shot & about 4 different Embossing Folders. It worked brilliantly! Mind you it does take me some time to think up some easy designs & cards, but at the same time, ensuring that the ladies will love them & get to use different supplies. It also gave me a chance to use up some of my retired stock. As with these classes everyone’s card always turns out very different, which is great! 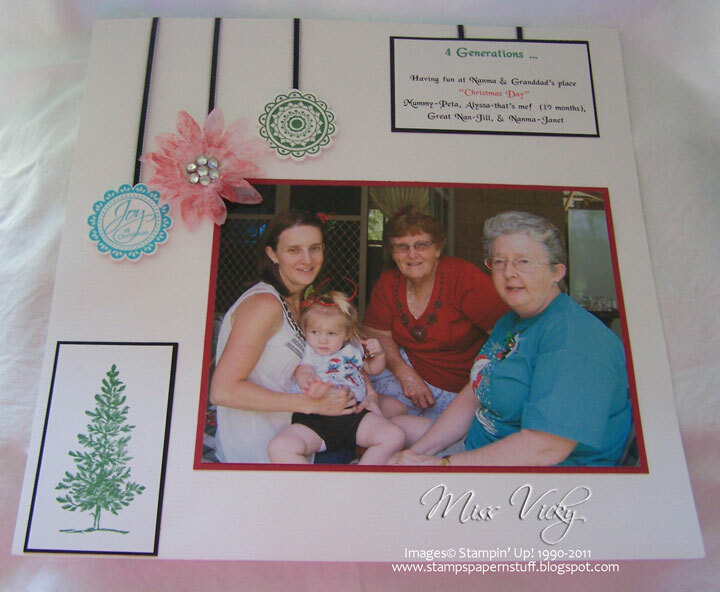 It was my turn to set the challenge this week over at Sunny Challenges & Creations. This is a very easy sketch as well as the 2nd part of the challenge being non-traditional christmas. Now this can mean non-traditional colours, stamps or both. It is entirely up to you…… We hope you will have heaps of fun with this challenge, better still join us this week. 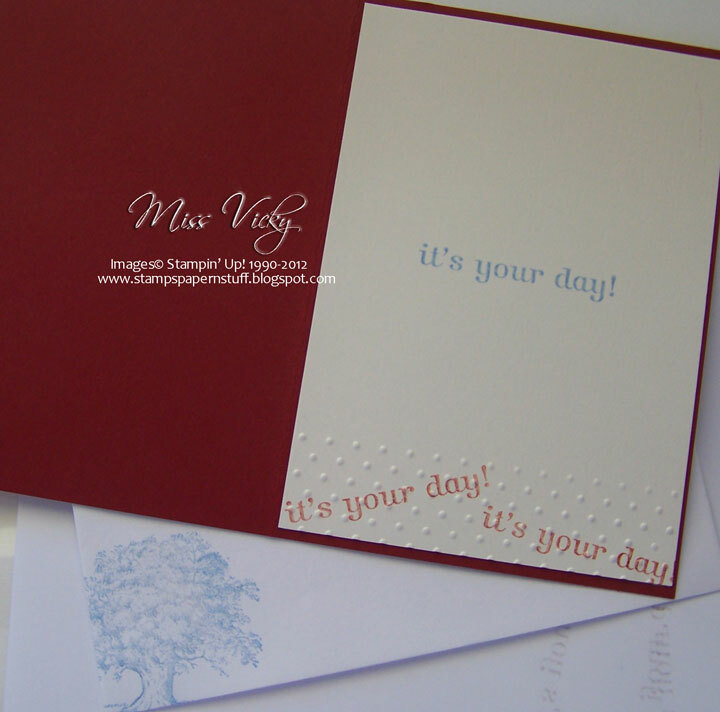 I run the larger piece of Whisper White Cardstock through the Big Shot using the Perfect Polka Dots Embossing Folder & the smaller piece of Whisper White using the Stripes Embossing Folder. 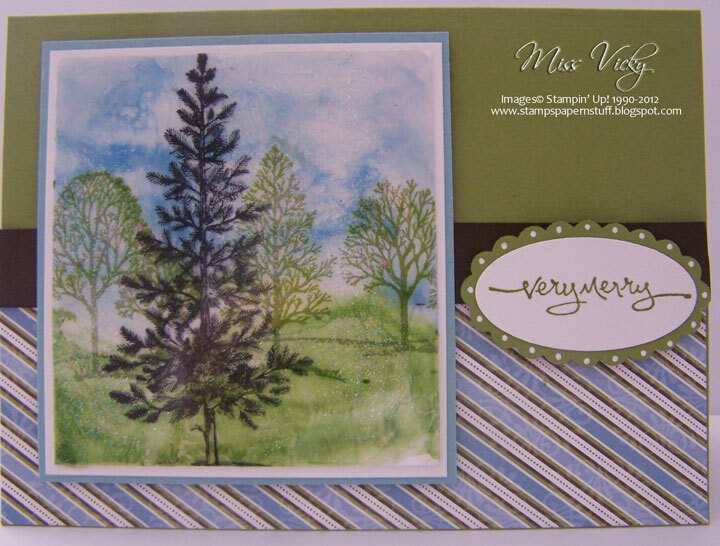 Both pieces were adhered to the Base Card – Basic Gray with Tombow Multi-Purpose Glue. I stamped the long piece of Whisper White Cardstock using Versamark & then Basic Gray, before embossing with Clear Embossing Powder. 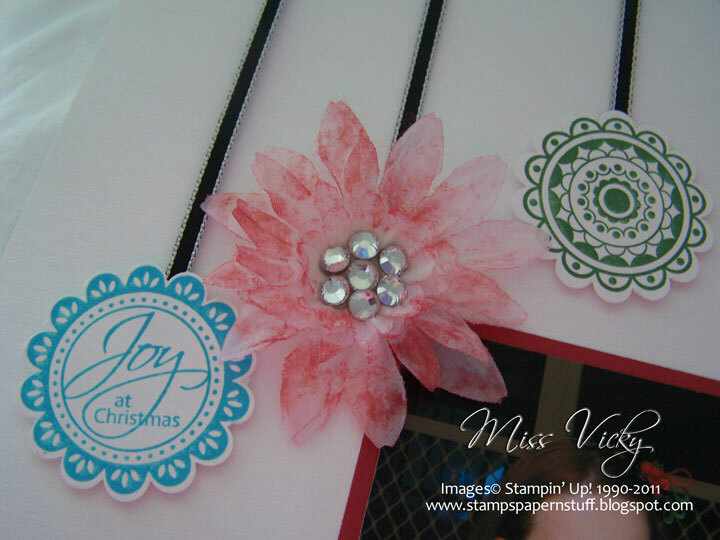 The embossed piece was adhered to the piece of Pretty in Pink with Snail Adhesive. 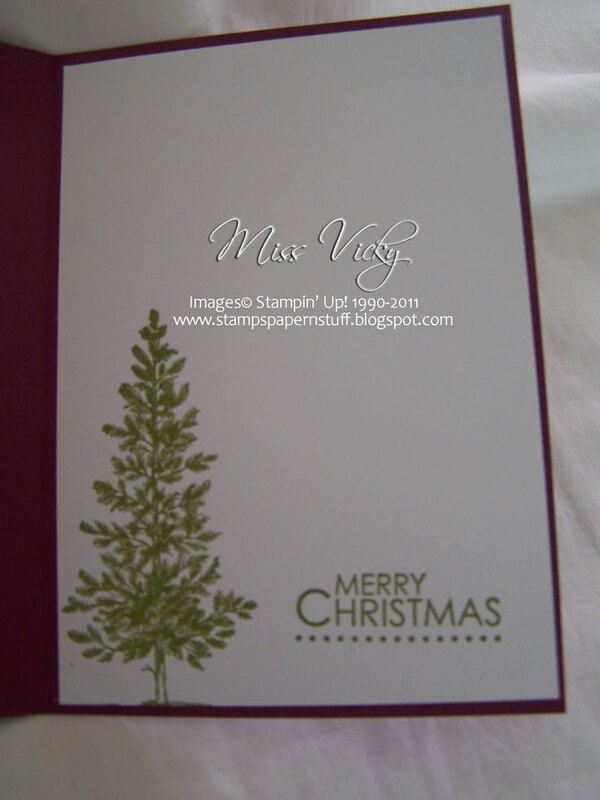 Thinking I didn’t have a “Merry Christmas” Stamp, I printed the greeting onto a piece of Whisper White Cardstock, punched with the Word Label Punch & adhered to the bottom part of the embossed piece prior to adhering to the Base Card with Stampin’ Dimensionals. 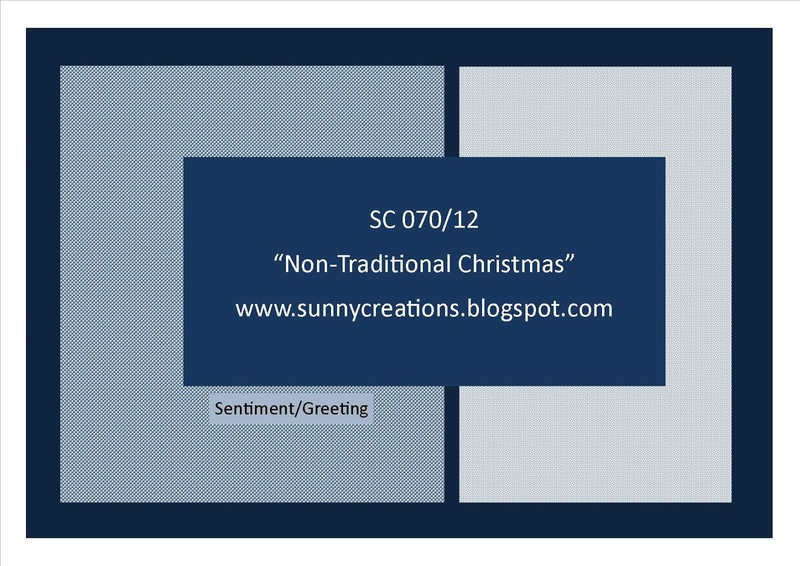 Why not head over to Sunny Challenges & Creations to check out what Kris & the other entries have created. We would love to leave you some comments. Today’s card is my version of the one we created in Crafty Creations yesterday. 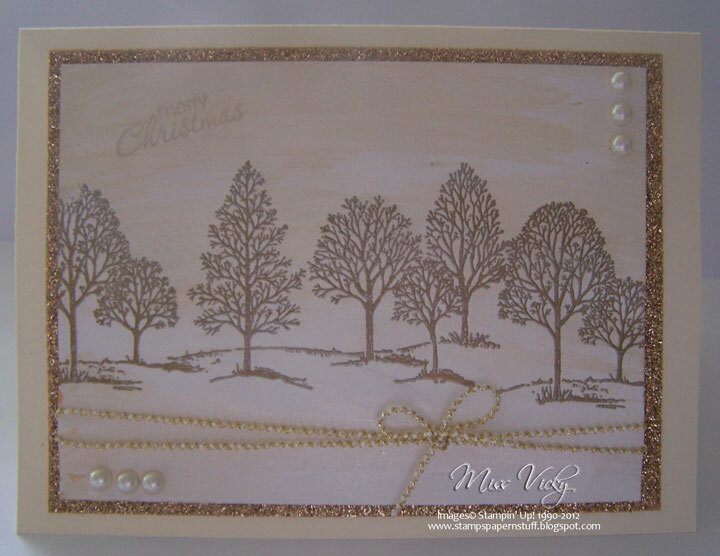 A lot of the ladies all had this lovely Christmas Tree stamp & wanted to recreate one of the cards Naomi had made using the stamp – sorry don’t have a photo of the original. After coming home & in the middle of preparing tea, I had an idea pop into my head on how to recreate a card that was similar using SU! Lovely as a Tree. I’m really happy with the way it turned out, especially the background & the greeting on the front which I repeated for the inside. Mind you, I sort of come across this from making something I wasn’t going to like…… , but then that happens so much when stamping. 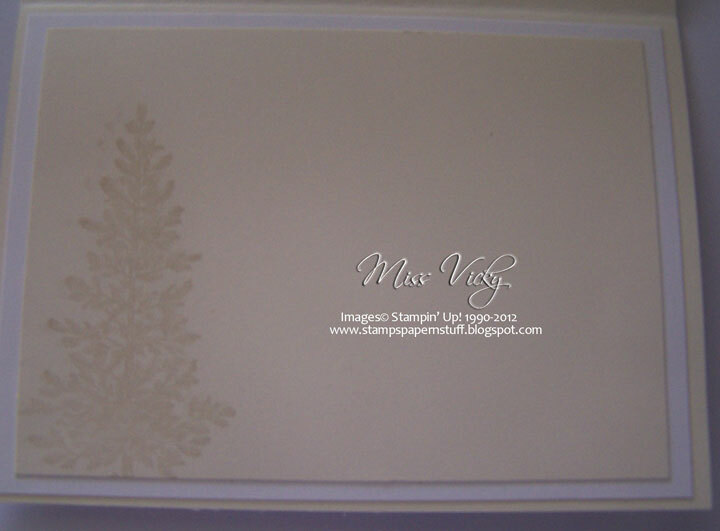 I stamped direct onto the piece of Whisper White Cardstock with Versamark, poured Gold Embossing Powder over the top, tapped excess off & heat set with Heat Tool. I then proceed to mix a tiny bit of Gold Paint that I had lying around into a little bit of Frost Shimmer Paint. The amount of Gold Paint I started out with was a about a small pin head & then built from there. I didn’t want too much gold as I just wanted it to blend into the background. I spread this with a piece of Glad Wrap which I just scrunched into a ball. For my sentiment, I wanted to emboss it in the Gold, but as I previously stated, didn’t like the look after tapping off the excess. 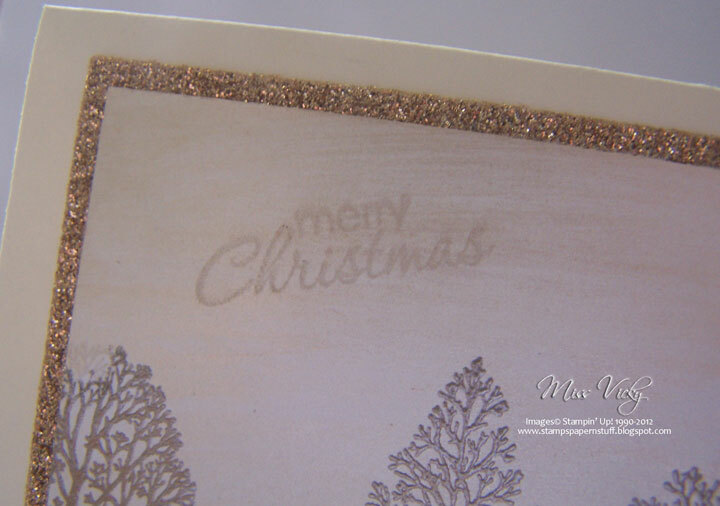 I then proceeded to brush all the Embossing Powder off the sentiment & was left with the faint image. It looks a little like stamping off a couple of times with ink, except I’ve done it with Embossing Powder. I tied the Thread around the bottom of the card twice, tied a bow & adhered to the Gold Glitter Paper with Sticky Strip. The whole piece was adhered to the Base Card – Very Vanilla with Snail Adhesive. To finish it off, I adhered Pearls to the top & bottom. All in all, a very simple, easy card, but am so happy with the final result! …. meets a Gatefold Fold. 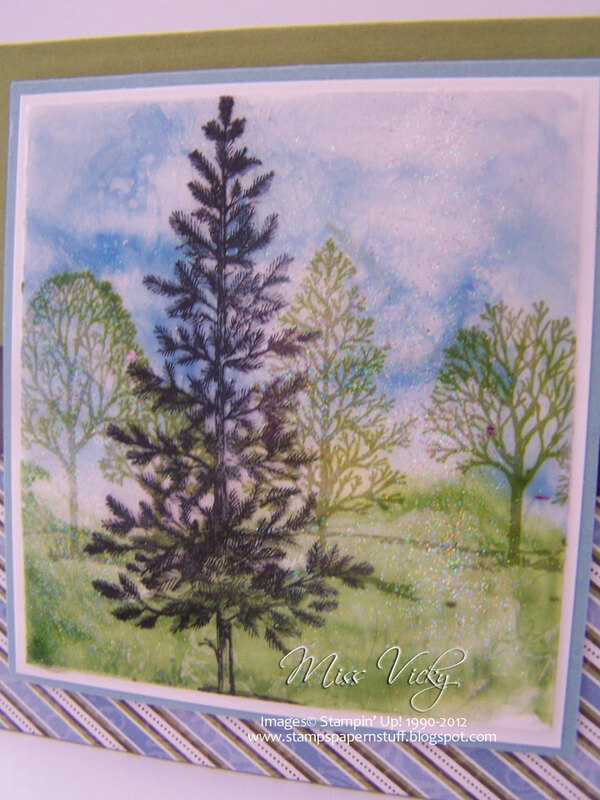 This is one of our cards we craeted in our Technique Class on Sunday – Shaving Cream! Now if you have never used this to create a background for your creations or anything else for that matter – do it! We had a lot of fun on Sunday, with heaps of laughs, shaving cream everywhere including in one of the ladies hair. 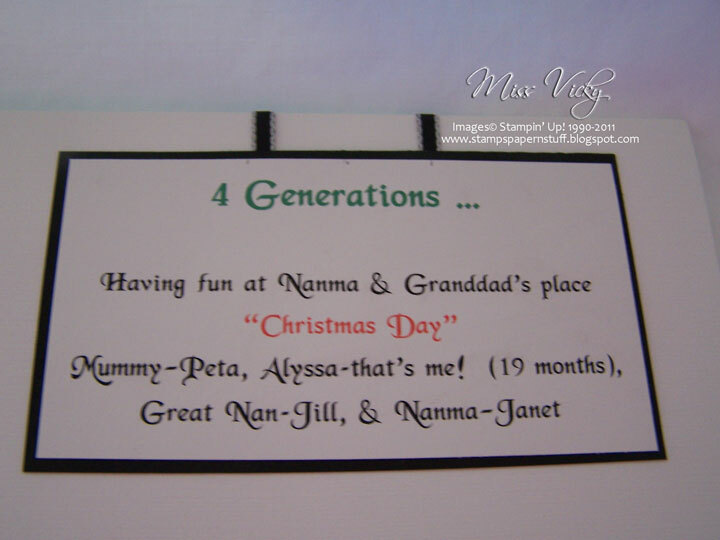 The best part about this technique – everyone’s cards will be different! 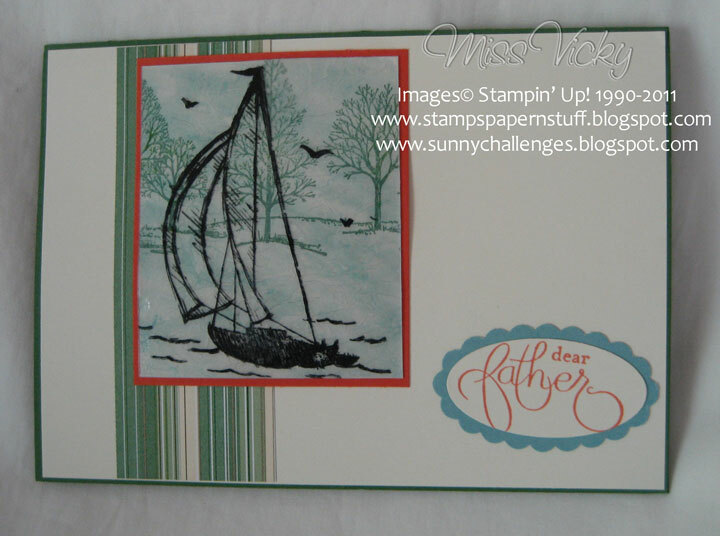 Pop back in a coupl eof days & I will be posting the 2nd card we created using this same technique. I’m a little behind in posting the cards we have been doing at our Technique Class. These have been running every 2nd Sunday arvo at the Caloundra Community Centre. I am really enjoying them as it has gotten me out of my comfort zone & my thinking cap on as I try to cater for the tastes of everyone, while at the same time creating cards that are a little bit different. 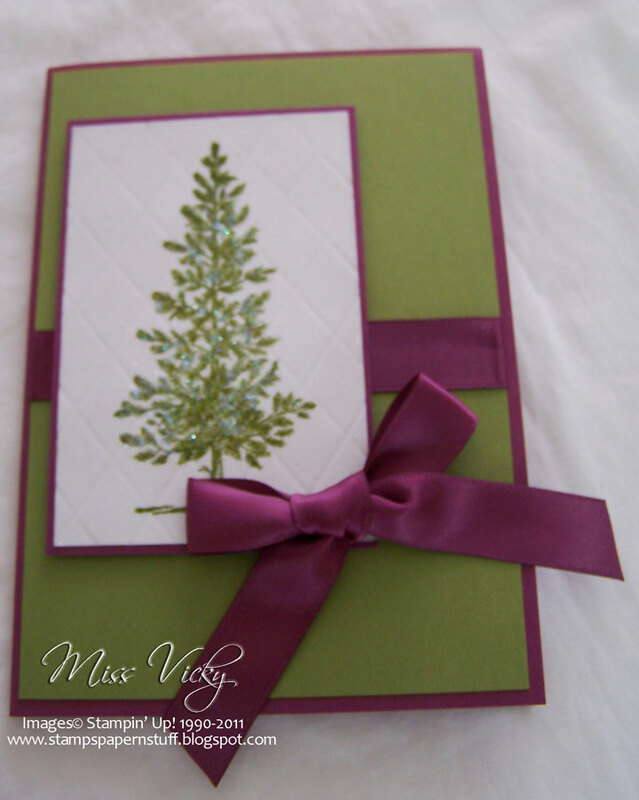 Each week we do one card that has a different fold & one standard card while still having fun doing our techniques. Our challenge over at Sunny Challenges this week has been bought to us by Kris. Along with the sketch, she wants us to use the Technique – Chalkboard. Tutorial at the end of post. Now, I am not a lover of this technique as I find it very messy, but will be the first to admit it does leave you with a very lovely effect. In fact, this is the first time that I have ever felt that I liked something well enough to post. Maybe, just maybe you may find me attempting to create more using this technique. I decided to use a Stamp Set that is a little different from the usual ones used for Chalkboard! Using the stamp I used, I had to change the shape of the oval a little, so hopefully Kris will forgive me for this. Mind you, that is the beauty about challenges, as long as you basically stay within the sketch, you have a free hold & it challenges you to use products, colours, techniques, etc you would not normally attempt. In other words, “out of your comfort zone“. I even used colours that are way out of my comfort zone!!!!! Ok, now it is your turn. Pop on over to Sunny Challenges, check out what Kris & Libby have created, create your card, scrapbook page, etc & then come back to Sunny Challenges & link to My Linky. I wasn’t going to scrap the photos I took on Christmas Day this year, but looking at them, I suddenly realised I had a photo of 4 generations…… It doesn’t happen very often, although Jill has 6 great grand kids…… the oldest being 16! She is often babysitting 3 of them, 2 of whom are twins, so they keep her on her toes. Mind you, she will not & has never given up her social life to babysit. She has always said to her grandkids, she would only look after them if she has nothing on. Well, in Jill’s social calendar that is not very often. I can’t wait to retire!!!!!!!!!!! The photo was layered onto a piece of Riding Hood Cardstock, leaving 1/8″ border prior to adhering to the Whisper White Textured Cardstock. For some reason I always like to use Textured Cardstock as my main page . I incorporated the flower that I wore in my hair on Christmas Day – made from a couple of flowers I had lying around, added Rhinestones to the middle & bamo, you have an ornament for your hair! I then hot-glued a clip on the back. The clip was removed as I adhered a couple of Stampin’ Dimensionals to the back. I also sponged a bit of Riding Hood Red Ink to the flower to make it pop a little. 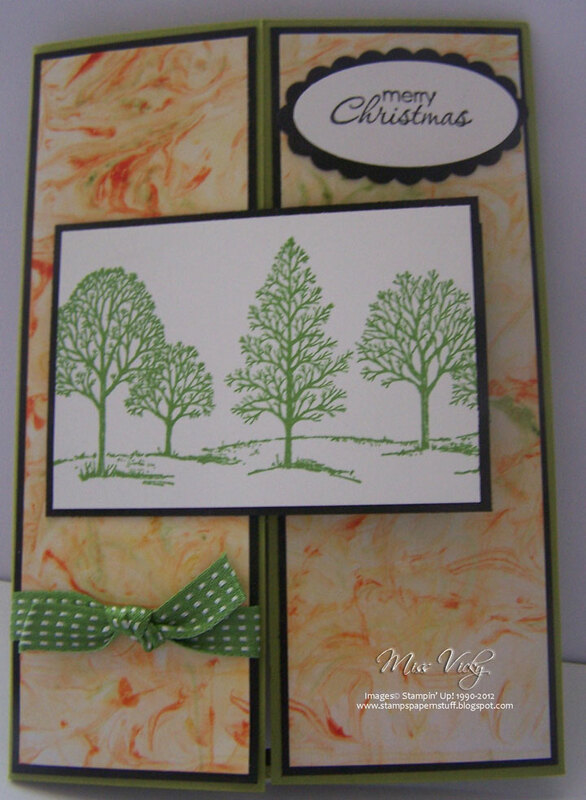 I stamped the tree with Garden Green Ink onto Whisper White Cardstock before adhering to a layer of Basic Black Cardstock & then to the page. For the Scallop Circles, I used one of the images from Circle Circus – have been wanting to use this set for something Christmas for so long – with Garden Green Ink, while the wording is in Tempting Turquoise Ink…. They were both punched using the Scallop Circle Punch. The journalling was typed & printed onto Whisper White Cardstock, before laying onto a piece of Basic Black Cardstock & then to the page. I used a couple of pieces of Basic Black Ribbon to look like the journalling & embellishments were hanging from the top. I basically wanted to keep the page simple & clean – my style of scrapbooking, while just picking up the suttle colours in the photo – Riding Hood Red, Tempting Turquoise, Garden Green, Black & White. Until next time, when I will show you the 2nd page! Stamp Set & one of my favourite colour combinations have been combined to create this card which we made last week for at the Community Centre. The ladies loved the colours! I stamped my image onto the piece of Very Vanilla Cardstock using Old Olive Ink. I then proceeded to score lines across the piece of cardstock at 1/2″ intervals. I then decided to try something a little different & experiment a bit, so I covered the whole piece with Versamark & poured Clear Embossing Powder over the top. ﻿ After tapping the excess off, I then heat set it with my Heat Tool. To add a little bit more WOW, I then applied Dazzling Diamonds with my 2-Way Glue. This piece was then adhered to the small piece of Rich Razzleberry. I adhered a piece of Satin Ribbon just below the centre of Old Olive Cardstock & adhered to the base card – Rich Razzleberry. I adhered the imaged to the top with SU Dimensionals. Not wanting to stamp a greeting & deciding it needed a little more something, I tied a bow & adhered to the top of the card. I did this card quiet sometime ago. In fact, it was for Father’s Day – so I must apologise for not having any measurements. 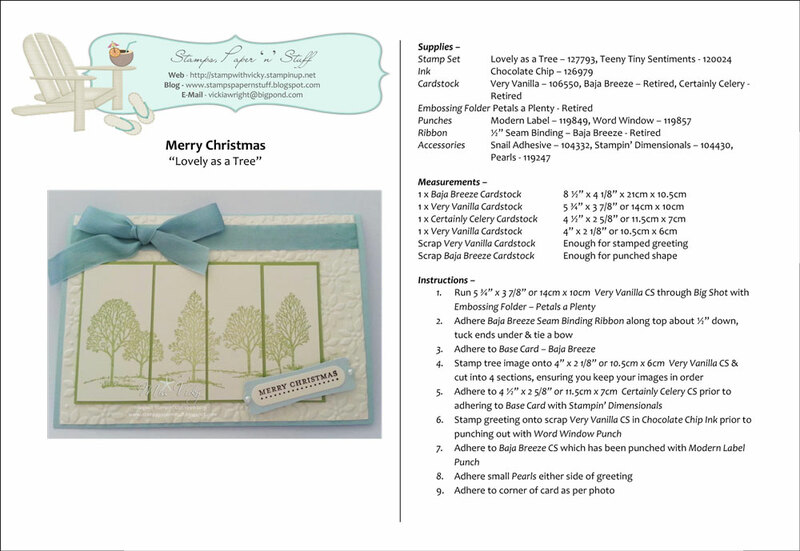 I found this great Technique – Acetate & Tissue, over at Splitcoast Stampers. 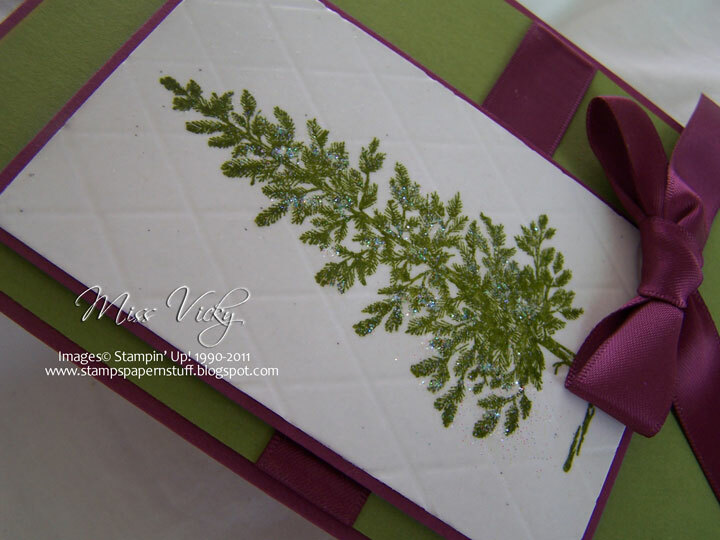 Using Snail Adhesive, I adhered the DSP to the piece of Very Vanilla Cardstock & then to the Base Card – Garden Green. 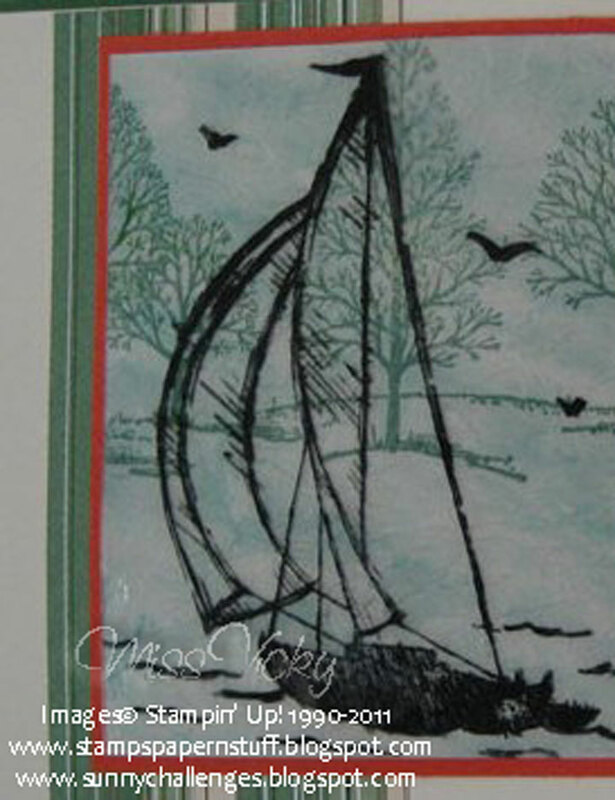 I stamped the boat image direct onto the piece of Acetate using Black Staz-On Ink & set aside to dry. 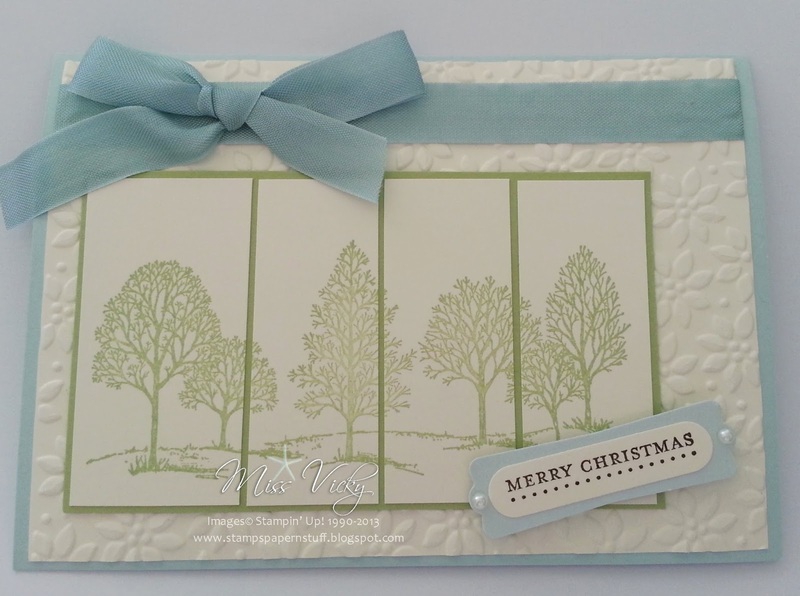 I stamped the tree images onto the piece of Very Vanilla Cardstock using Garden Green Ink. With the piece of stamped Acetate, I applied Crystal Effects all over the back, ensuring the Effects were covering a large part of the Acetate. Once this was done, using my Garden Green Re-Inker, I applied a couple of random drops onto the Crystal Effects & moved it around with my finger until I was happy with the look of the coverage. At this stage, I added a little of Dazzling Diamonds to give it a little bit of a lift & some sparkle behind the Acetate when finished. I then added a larger piece of tissue over the whole lot, turned the Acetate over so that the front was now facing me & placed it over the piece of Very Vanilla Cardstock & pressed into place. I trimed the piece to the size I wanted which in this case, was slightly smaller than the Tangerine Tango Piece I was adhering it to. This whole piece was adhered over the top of the DSP & to the Base Card. 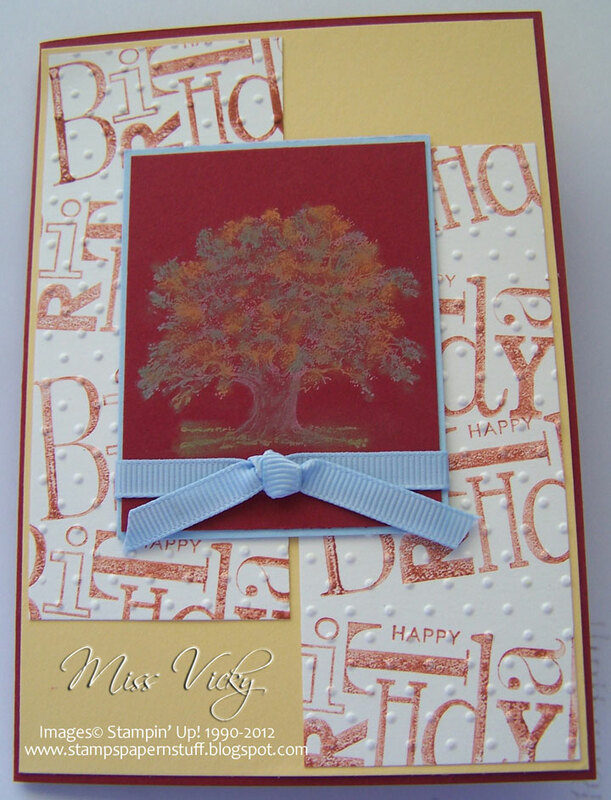 I stamped the greeting onto a scrap of Very Vanilla Cardstock using Tangerine Tango Ink, punched with Oval Punch & adhered to piece of Bashful Blue which had been punched with the Scallop Oval Punch. I applied this to the card with SU Dimensionals. The final result for this technique is really stunning & has so much potential. I must make another card using this technique again.